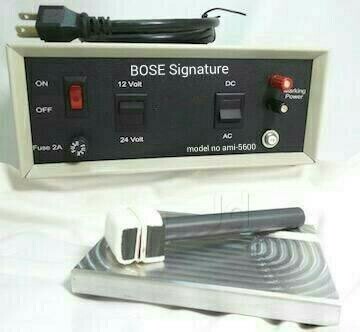 BOSE Signature we are leading manufactures and suppliers of a range of Electrolytic marking machine based on an electrochemical etching process where the image of a stencil transferred to an electrically conductive product by action of electrolyte (saline solution) and electricity. The etching machine can be used on all surface profiles. This can be used to mark metallic items like cutlery, drills, taps, tools, engine valves, medical intruments, sanitary hardware, gears, nozzels, cooker parts, ball bearings and many more. Known for manufacturing and supplying the premium grade of Marking Machines, Electrolyte Chemicals - AE34 and Electrochemical Etching Machines,Electrolytic Marking Machines, Chemical Etching Mchines, we, Radhika Enterprise, came into existence at Delhi. For manufacturing Marking Machines, Electrolyte Chemicals and Photographic Stencils, we make use of latest technology and machinery. Streamlined manufacturing of marking machines, electrolyte chemicals and photographic stencils, is assured through well-equipped infrastructural facility. The making machines are used for the purpose of marking metals in the most efficient manner. Owing to their easy usage, compact design, longer functional life and consistent performance, the Marking Machines, Electrolyte Chemicals and Photographic Stencils are highly demanded. Large production capacity and well-equipped storage facility has helped us in managing the bulk assignments of Marking Machines, Electrolyte Chemicals and Photographic Stencils. Wide distribution network has helped us in delivering the Marking Machines, Electrolyte Chemicals and Photographic Stencils within promised time frame. Based on their needs, we provide Marking Machines, Electrolyte Chemicals, Metal Marking Electrolytes and Photographic Stencils in various technical specifications.